While wandering the streets of Prague recently, we were reminded that July 3, 2008, will mark the 125th anniversary of Franz Kafka’s birth. 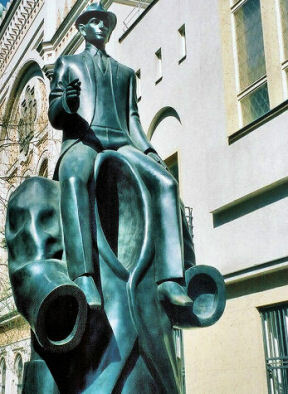 And so we were inspired to undertake a special project: Finding Kafka in Prague. When it is finished next year, Finding Kafka in Prague will include a wide range of material, from informative text and irreal Flash animations to quizzes and puzzles. We hope in this way to show the extent to which Kafka can still be encountered in his native city, in a way that he might have found some affinity with. We present here a draft version of the first portion of the project. We would appreciate any comments and suggestions you might have, which should be sent to editors@cafeirreal.com. USERS WITH DIAL UP CONNECTIONS: Please note that each of the pages has, as a key component, a Flash presentation embedded in a standard web page. Some of the animations can take twenty to forty seconds to download on a 28 to 56 kps connection, though the text for the page will come in almost immediately.